You know how annoying it is when you can tell someone’s just waiting to talk when you’re talking to them? If you want anyone to like you, ever, don’t be that guy. 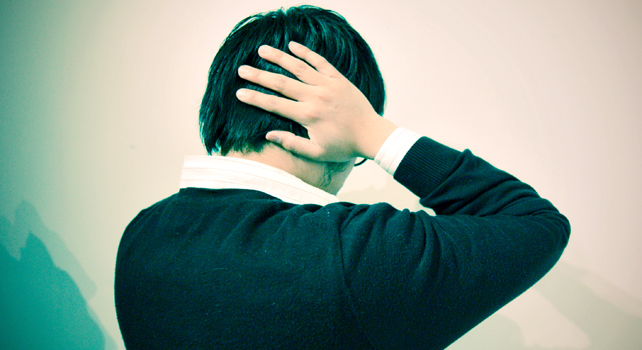 Poor listening habits are responsible for many of our daily woes. Whether it’s a damaging disagreement with a co-worker, a miscommunication with a spouse or partner, or an awful customer service experience, the smoking gun is often a simple failure to pay attention–to truly listen to what the other person is saying. Sure, it’s easy to develop techniques to help you remember what people say–that’s “two-ear” listening–and perhaps if we did that we’d all have fewer disagreements with our colleagues, family, and friends. But better two-ear listening will only take you so far. If you really want to take listening to a more life-changing level and impact your excuse-making habit, then developing your heart-based “third-ear” listening skills is absolutely essential. If you listen with your “third ear,” then you don’t filter what you hear with supposition, stereotypes, judgment, what someone else said, and bitterness. You don’t let past experiences with someone limit your ability to truly empathize with someone else’s “life load.” Third-ear listening also means engaging and connecting with another human being on an emotional level. As a business and personal coach and speaker, I see the power of making this primal listening connection through my interactions with diverse groups of people and individual clients around the world. For example, each year when I teach my Rutgers International Executive MBA global leadership course in China, I face a diverse group of engineers, project leaders, programmers, and consultants who are accustomed to using their analytical left brain at work more than their interpersonal right brain. Frankly, I can see in their eyes at the outset of my classes that they’d rather be giving a lion a manicure than be in my classroom. These students know that for two weeks, no economics, statistics, business analysis, spreadsheets, marketing strategies, research projects, or pie charts will be discussed. Instead, they know they’ll be required to use their heart connection to lead, develop, manage, and build relationships with the teams and individual performers. Slowly over those two weeks, I watch the left-brained future captains of industry get it, and I observe a profound shift in their attitude as they fully understand the power of managing and listening from the heart. What blurs your listening vision? When I consider my listening track record, I can remember countless times when I shut down, got defensive, or disengaged. The common denominator for me was usually anger, agitation, impatience, resentment, bias, or the desire to be right. I know my body attended those conversations, but my mind and empathetic, supportive third ear went for a walk. I remember one particular sales call from a couple of years ago that I didn’t get because I clearly was not listening to the client. Throughout the meeting I was given plenty of clues as to how I should steer the conversation if I wanted the work, yet I kept right on talking, selling my services and preferred approach and not listening. When I didn’t get the job, I resisted the temptation to find a convenient excuse and instead asked the potential client. That call confirmed what I deep down already knew: I wasn’t listening and it cost me plenty. Can you recall similar incidents that, when looking back with the clear vision of hindsight, you admit to having a conversation with an inoperative third ear? I believe our collective lack of listening skills is one of the biggest challenges we all face. Poor listening skills put up roadblocks to your job advancement; poor listening prevents us from having deep and meaningful relationships with our spouses and partners; and, worse, a lack of third-ear listening puts dangerous barriers to keeping peace between nations. First, make a vow to yourself to be a better listener. That’s a great start–simple but profound. Listen to understand, help, see, and support, not to comment, disagree, and find fault. Listen for what the other person is not saying. Refrain from letting your past or your desire to “fix” the problem or concern get in the way of hearing the entire message. Ask for clarification only when necessary. Practice these techniques by telling the person you’re having a conversation with to touch your arm every time he or she feels you’ve checked out of the conversation. Reprinted, with permission of the publisher, from THE NO EXCUSE GUIDE TO SUCCESS (c) 2012 Jim “Mr Energy” Smith, Jr.
Jim, President and CEO of JIMPACT Enterprises, Inc., is an internationally known author, empowerment/motivational speaker, trainer and coach who has transformed the lives of thousands across the world. Jim is the bestselling author of the books From Average to Awesome: Lessons for Living an Extraordinary Life, CRASH & LEARN: 600+ Road-Tested Tips to Keep Audiences Fired Up and Engaged! and the co-author of The Masters of Success (along with Ken Blanchard, Jack Canfield, John Christensen and others). 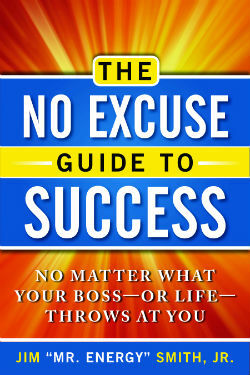 His newest book, entitled The No Excuse Guide to Success: No Matter What Your Boss or Life Throws at You, provides valuable insight into ways to create positive outcomes through responsibility and personal accountability.